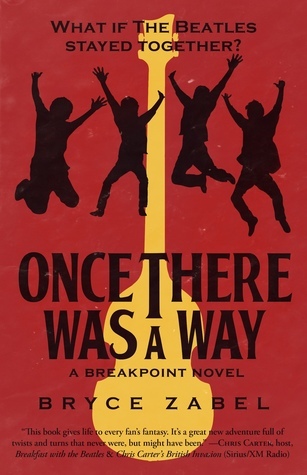 Buy Once There Was A Way at Amazon. Read author Zabel's biography on Goodreads, and you'll find an impressive resume steeped in sci-fi and speculative fiction, and it's not limited to book format. 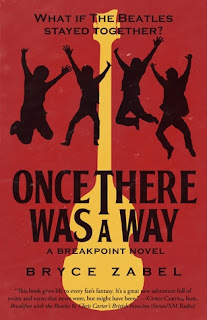 Once There Was A Way is an alternative history, and while it is a work of fiction I hesitate to call it a novel. It's not a narrative in the traditional sense, like previous Beatle-related fiction reviewed here. Ian R. MacLeod's Snodgrass stands out in my mind because it also asks "what if?" That story followed John Lennon in a life of near squalor, having left The Beatles before reaching any level of international fame. Once offers not just a "what if" but "what could have been." The book begins in 1968 at the dawn of the Apple age, with John and Paul about to announce its genesis on The Tonight Show. Immediately the trajectory veers from actual history. Reality shows (or it would, if the full footage still existed) John and Paul had to settle that night for a substitute host, Joe Garagiola. Book John and Book Paul have enough sense to hold out for the real thing, and Carson jumps. From there we're treated to a story laid out in lengthy Behind The Music style as The Beatles flirt with divorce but ultimately agree to probationary periods of togetherness for the sake of keeping Apple viable and solvent. They agree to completing film and album commitments, yet take turns gazing longingly at the exit. Unlike bands that stay together for the paycheck despite passing their prime, The Beatles continue to spin gold. Zabel threads in non-events ingrained in band lore (the invitation to Woodstock, the Lord of the Rings adaptation) and makes them happen. As the band's life span lengthens, so some of the individual achievements in song become those of the group. Some moments in the story seem almost too far-fetched and Forrest Gump, even for speculative fiction, but as escapism it inspires a smile. My big issue with the book was the style. Once I realized I didn't have a straight narrative story I felt apprehensive about following through. The strength of Once There Was A Way comes in the characters. If you're big on The Beatles you're more likely to enjoy this than a non-fan. After getting through the initial chapter about The Tonight Show, I found my groove and finished this with good speed. As for how long The Beatles remain together in this book, and who survives to the end, I won't spoil it. I will say Zabel's ending probably reflects the feelings of a number of fans who had hoped for more after 1970. An ARC from Netgalley was received from the publisher for the purpose of this review. Kathryn Lively is looking for her next book to read. Every summer I say I will read more, and every summer I flop on the couch and pray for winter to hurry up. If it's possible to feel too hot to read, I've achieved it. I fear I've reached a point in my life where I have to psych myself not only to read a book, but discuss it. Typically I pledge to read 150 books a year on my Goodreads account. This year I shot low - 50 - but I'll surpass that number. By how much, I can't say. This title is short. I picked it up during a Kindle Unlimited trial that included The Handmaid's Tale and a Fred Stoller memoir. The sub-title on the cover misled me at bit. 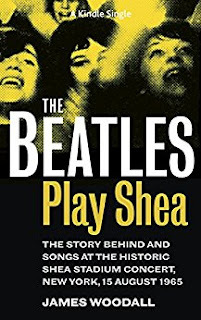 I had expected to read an actual history of the landmark concert at Shea Stadium and instead came away learning very little. There's buildup to the event but little substance, and at times the narrative strayed to other topics distantly relevant to the event. Most Kindle singles tend to be essays that may appear in parts in magazines, or long chapters of current or future works. I get the impression it's the case here. Had I purchased this title instead of taken advantage of it during the KU trial, I would have been more disappointed. I can't explain what it is about the Altamont concert that attracts me. I've seen Gimme Shelter and read other accounts of the day (there's a Kindle single about this, too, reviewed here). Somebody even made a short documentary about Meredith Hunter, the man stabbed by a Hell's Angel security guard. It's all history seems to tell about the day, but if the topic is new to you this book covers everything from the initial plans for the concert to its multiple tragic aftermaths. I hadn't realized Hunter wasn't the sole casualty at Altamont, and I won't spoil the book's contents. It's an engaging tangle of ambition and opportunity in a time when the Stones struggled to compete for face time - with the Beatles fading from the picture, now they had to deal with the California sound and recent Woodstock alumni. 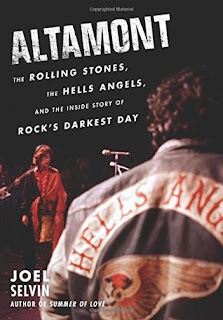 Altamont was to have been the West Coast answer to the festival, and this book offers up a nice guide on how not to plan a free concert. It's a story that may make you angry as well, particularly when you read of Hunter's story and that of friends and family after the show. Super-fandom exists for pretty much anything - sports, musicians and entertainment franchises. If you were close to the object of affection and release a memoir to coincide with a landmark moment - say, the anniversary of the object's untimely passing - you're certain to get some side eye and murmurings of "cashing in." Because fans desire to keep their connection alive through new information, you'll also get sales. Look at this blog, I've read over a dozen books about the Beatles. Surely by now I know everything there is to learn about them, right? You'd be surprised, and I'll read a dozen more Beatles books in the future, I'm sure. On the spectrum of fandom, I am probably a step above casual fan status where Prince is involved. I keep the songs playing when they come on the radio, and I watched the award show/Super Bowl performances. I even watched his guest spot on that sitcom I'm too lazy to Google right now. More avid fans do have opinions on The Most Beautiful: My Life With Prince (AMZ), some questioning Mayte Garcia's decision to discuss intimate moments about a man who valued his privacy. 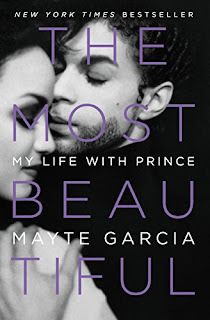 Knowing so little about Prince the man, aside from what I found in the other Prince book reviewed here, I am grateful for the opportunity to read Mayte's story, and it's encouraged me to seek out his post-Diamond and Pearls material for a listen. So, if you're a huge fan, know this book is exactly what it advertises. Garcia, the first Mrs. Nelson, chronicles a near fantasy tale about a young, in-demand dancer with admiration for a world-famous superstar. An ambitious parent gets a demo tape to pass into the right hands, hoping at the very least it will inspire the casting of her daughter in a music video. Instead it ignites a friendship that slow-burns into a love story. As part of Prince's inner circle, Garcia picks up quickly on signals. She learns which women interest Prince, what's expected of her as an official employee of the New Power Generation, and that the squeaky wheel gets the grease - especially where a living wage is concerned. What she originally anticipated as a once in a lifetime opportunity to perform in a Prince tour becomes a long-term backstage pass, acclimating to Prince's eccentricities and sharing in his accomplishments and failures. Following a brief marriage and personal tragedies, the story takes a bittersweet All About Eve turn as she recognizes the signals that forewarn of her eventual dismissal from Prince's life. The Most Beautiful is a short book. One could read it in a long day, but by no means is it an exhaustive biography of Prince. It's a glimpse into a period of romantic gestures, sadly lacking an HEA, and one - like the other Prince book reviewed here - that strives to be kind to its subject. I've noticed on Goodreads how some fans have taken Garcia to task on a few observations of Prince, and her mother loses points with some for "foisting" her underage child on a man they know only from Purple Rain. This isn't Bill Wyman and Mandy Smith, though - Prince and Garcia were not a conventional love story, but the book doesn't turn lurid. I'll continue to seek out an objective Prince bio, but I do find The Most Beautiful provides a fascinating portrait. Once upon a time I had about a hundred eBooks housed in a library connected to an online retailer. If you know the site of which I speak, you know they folded at the turn of the year and gave customers a short window of opportunity to download and save. I managed to get twenty books to safety but unfortunately one of them wasn't my copy of Kicking and Dreaming: A Story of Heart, Soul, and Rock and Roll, which I had purchased a few years back with the intent of reviewing here. I'm slowly working to replace what I lost, what I remember buying, anyway. Not unlike the reading of the book, I seem to fall behind where Heart is concerned. I had become aware of their existence in the early 80s but didn't give thought to the singles out at the time. "Tell It Like It Is" and "This Man is Mine" were a bit too doo-wop and ballad-y for my tastes then, despite Ann's killer vocals, and I hadn't realized these songs weren't necessarily representative of the overall Heart sound. Then by the mid-80s they'd launched into this MTV, male-gaze video era with the gold corsets, big hair, and bouncing boobies before a backdrop of flashpots and lightning. It appeared a bit much, but that was the point of the 80s - excess for success, and Heart was a 70s band pushed to take those extremes to stay relevant and solvent. In a way it worked, because the frequent radio play encouraged me to seek out their earlier hits. It wasn't until a few years ago, though, I took the opportunity to see them live - both shows post-Hall of Fame victory laps. My daughter and I loved them, but with these recent family fallouts happening I fear there won't be other concerts. Well, I got a replacement copy of the book. Upon finally reading it I find it's presented in "oral history" format with Ann and Nancy on a round robin storytelling pattern. There are a few books reviewed here that employ this writing method (VJ, Starting Over, Nothin' To Lose) and while it's not my favorite style I find it's effective when you have several voices in the chorus. Oral history books risk a breakdown of cohesion in telling a story, but more perspectives help to create a large picture and a better sense of time and setting, even if dates aren't exact. 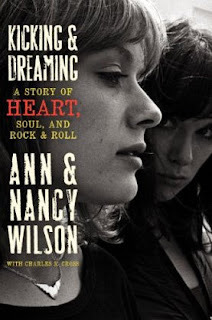 But for a few "guest shots" in this book - collaborators and former bandmates - the book is mostly Ann and Nancy, which is appropriate in a way, considering they are the most visible faces in Heart. For years I used to think Heart was strictly a duo. Shows what I know. Kicking and Dreaming tells the evolution of the Wilson sisters' career in their own words, starting with a shared mobile military-family childhood, through thankless gigs in Canadian bars and early battles with their first label. Similar to points in lives like Lita Ford's, the sisters contended with sexism in the industry (even from female execs - e.g. the corset years) and not-always faithful companions. They have great anecdotes to share, particularly about early touring years and the struggle to become known for original work rather than covers. One such story about John Mellancamp may encourage you to whack him upside the head when you see him next. For everything interesting in Ann and Nancy's journey, though, I tended to be pulled away from it at times due to the book's presentation. I note there's a third author listed and I'm not sure of his purpose, given the spots of spelling and syntax errors throughout the book. Other reviewers have noted continuity errors - incorrect release dates and such - but if I don't intimately know a band's discography I'm willing to forgive such things. Memories may challenge us, and I got the impression Kicking and Dreaming came out as a transcript with a perfunctory polish. I appreciate Heart more than I did in my youth. Rock music is a male-dominated industry and I suppose we're conditioned to gravitate more toward male artists. Ann and Nancy challenged that norm early on by fronting a band, writing songs and playing their instruments. We see more women leading groups as a result, and if more are able to catch breaks in this business they may have the women in Heart to credit. Kicking and Dreaming is a rich history with rough spots, but worth reading.